increase emphasis on internationalization of the subjects included in a course of study in school. The term Globalization means society. 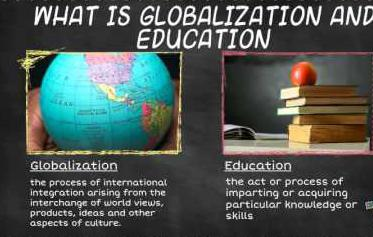 Globalization and education makes their nation to grow increasingly. Digital Education makes the student think wider and make student to think in their own way. The future of the economy, jobs, and other national challenges is always unpredictable, but a good education is the best tool we have to prepare the future generation. With globalization some of the challenges for knowledge, education and learning will provide today’s learners the ability to be more familiar and comfortable with the concepts and uncertain situations. Globalization creates and supports information technologists, policy makers, and practitioners for the purpose of rethinking education and supports mechanisms for the exchange of ideas and experiences in the use of educational technologies. Using advanced information and communications technologies, a new system of knowledge, education and learning will make the teacher to under student in the best way. Education is not only reading books and gaining knowledge, make student to think innovative. Why Students have to think Innovative in today’s world? In today’s competitive world innovation play’s major roll. To survive in world, we need to think smart. Always smart work wins the world. Education play’s a key roll in people globally. How to teach Innovative in today’s world? First teach, how to think. Always make students to do team work. Team work will make more knowledge sharing which helps everyone to learn different ideas. Knowledge sharing, skills, and intellectual assets that are necessary to multiple developments at different levels. Working in teams requires students to develop skills in group dynamics, compromise, debate, persuasion, organization, and leadership and management skills. Always support mechanisms for the exchange of ideas and experiences in the use of educational technologies. Always makes the student to raise the questions. Innovation experiences that prepare students for multinational leadership roles.